The BRAIN, Brain, Brain, Brain . . .
Did you start singing a certain cartoon theme song in your head? Music is a powerful tool that sticks in our memory. As someone who works with children, there are many times I wonder what is going on in the brains of these little ones. What can I do to richly engage their brains in learning? Involving children in song and music activates almost every part of the brain. The part of your brain that memorizes songs is a magnificent storage device. How useful to have the word of God stored in your head for easy reference whenever you need. 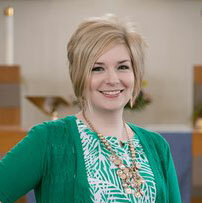 Books of the Bible songs, hymns, and songs with promises for youth are invaluable in times of trouble, testing, or joy. Let these words be committed to their lifetime memory for their easy recollection. The hymnal is full of songs that teach the Bible stories, theology, and promises of God that we work so hard to instill in the hearts and minds of our children. For a deeper look at why it’s important to take time to teach hymns and songs to children read this blog: The Importance of Teaching Hymns to Children. How do we integrate the teaching of hymns, church liturgy, and songs into our routines to help children commit them to memory? Here are some helpful tips tried in the field by the musically inclined as well as those with very little music teaching experience. Teaching children what the words of a song mean can help to give it purpose and richness. Hopefully, they will use the music to make connections to the world around them. Children can rote memorize words begrudgingly or even subconsciously. However, if you leave them to interpret the meaning of the words alone or through a worldly lens, the precious promises and Biblical understanding can become skewed. You can break down this teaching into phrases that you do in parts each time you work with them or do a larger block at a time. If you do the latter, use visuals and some of the list below to keep children actively engaged. Motions or actions allow the kinesthetic learner to utilize concrete movements to memorize cerebral concepts. They unlock more parts of the brain and keep children of all learning styles engaged. It can also relieve tension and build bonds when a whole group is enjoying the beauty or the silliness of movements together. Very young children grasp onto actions and use them to further attach meaning to what they are doing. Many children need these motions as cues when they are learning words but then will bust them out in joyful praise when the song is memorized. Try to make motions simple and consistent with the words so that they are furthering the teaching and not causing a whole new set of explanations. The disappearing challenge is a tool Kevin Zorena, the assistant cantor at Bethany Lutheran Church and School uses with many ages he teaches. With the 2nd and 3rd grade children, he writes the entire stanza of a hymn on the board and sings through it many times with the children. Then he challenges them by erasing a few words at a time to see if they can sing the verse without them. The children see this as a game and often ask him to, “Just erase the whole thing!! We can do it!” They have a sense of ownership in the challenge that excites them. The focus changes from the hard work of memorization to the fun work of succeeding at a game. You also can use flashcards with key words or pictures as cues to memorize. See how fast you can get through the stack of them without the children stumbling through. Letting fun be a part of the learning will only help the morale of children, but be ready for the energy! Let them hear the song and see it often! Sing it when you are together. Give the parents the words or CD/music file to sing songs with the child. Play the songs during down times or when the children are walking in the room before you begin. Let it be pushed deeper and deeper into their memory through reinforcement. If you choose music that is also sung in the church services, this gives children more opportunities to encounter it and attach deeper meaning. Hopefully these tools will help you to embrace and not avoid teaching the sophisticated language and lessons of these songs. Let the Spirit use these words in the lives of children God puts before you. It may take some dedication of your time with them but it will be worth it. Side effects may include: greater participation in church service (as children feel empowered to better participate), renewed joy in parents (as they see their child’s excitement and participation), and spending time praising God in the car with their singing as opposed to the melodies the world wants to teach us. Use that miraculous creation, the brain, to its fullest to further the teaching of God’s word in the faith lives of His children. Share VBS music with kids at your church using the Splash Canyon Passalong CD and DVD! 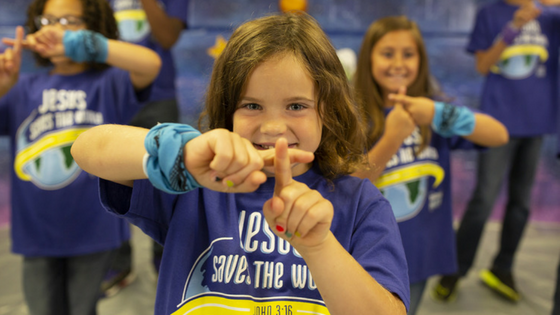 Teach kids at your church the words and actions to songs about Jesus at VBS or Sunday School!